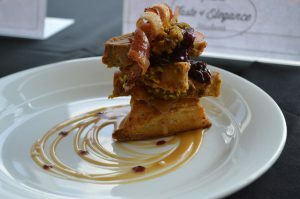 The Iowa Pork Producers Association held its annual Student Taste of Elegance competition on March 6 at the Des Moines Area Community College’s Iowa Culinary Institute in Ankeny. Eleven teams of students from Iowa Western Community College, Iowa State University, Scott Community College and the Iowa Culinary Institute each prepared an original pork tenderloin entrée for judging on taste, appearance and design. 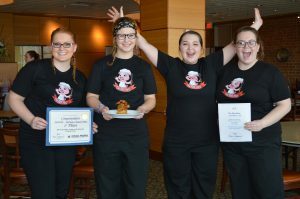 The Red Hats from Iowa Western took first place honors with their “Pistachio Encrusted Pork Tenderloin.” The students on the team were Katelynn Hunter-Mullin, Ann Snyder, Jennifer Christensen, Taylor Post and each student received $100 from IPPA. In addition, their culinary program at Iowa Western received a $750 check for scholarships or classroom supplies. The DMACC Swine and Dine team placed second. The team prepared “Apple & Brown Sugar Pork Tenderloin with Bacon and Creamed Corn Succotash.” IPPA awarded each student $50 and DMACC will receive a $500 check for scholarships or classroom supplies. The third-place team was Jalapeno Business, also from DMACC. The team prepared “Un Sabor De Cuba.” Each student received $25 from IPPA and their school will receive a $250 check for scholarships or classroom supplies. The event is held to inspire innovative and exciting ways for culinary arts students to use pork in their menus, measure their progress and practice working as a team in the kitchen. A team of judges provided immediate feedback, critiques and professional advice for the student teams. The IPPA Student Taste of Elegance is open to any Iowa college that has a culinary arts program.